I don’t usually read a lot of non-fiction but something about this story really drew me in and, to use that well-worn cliche, “you couldn’t make it up”. From a daunting mountain of documents, Catherine Bailey has succeeded in excavating an intriguing and involving true story of one man’s life – a very sad story emerges as she fills in the gaps in the life story of John Manners, the 9th Duke of Rutland. This is a very detailed and extremely well researched account which highlights the immense power held by the Manners family – power which is abused by Violet, John’s mother, who is portrayed as a manipulative matriarch, determined to safeguard the future of the family line, at any cost. Could duty to one’s family possibly override duty to one’s country at a time of war? When you don’t have the luxury of “an heir and a spare” does the end justify the means? Despite John’s efforts to cover up events, he hadn’t reckoned on the tenacity and investigative skills of Catherine Bailey. It makes you feel quite sorry for some of the aristocracy although that is tempered a lot when you consider the immense numbers of Rutland estate workers who died in the trenches during the Great War. A very engaging and eye-opening read. So, it was with slight trepidation that I picked up A Rift in Time, Raj Shehadeh’s memoir of his great-uncle Najib Nassar. Raj is a prominent Palestinian lawyer and human rights activist. He lives in Ramallah on the West Bank, currently under military occupation by Israel. 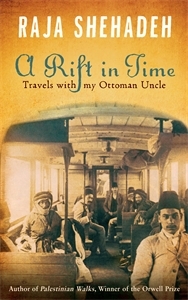 In this book, he retraces his uncle’s footsteps during his time on the run from the Ottoman authorities between 1915 and 1918. Najib came under suspicion of espionage and treasonable activities as he voiced opposition to the Ottoman participation in World War I and spent three years in hiding in different locations, depending on the generosity of friends and foes alike. Raj’s present day journey, following in his uncle’s footsteps, lacks the fluidity of Najib’s adventures, given that he is faced with border restrictions, army checkpoints and other physical obstructions. He finds the landscape ravaged by the intensive farming favoured by the Israeli settlers. Villages which welcomed and sheltered Najib back in the 1900s are now wiped off the map, having been razed to the ground in 1948. I found it useful to have a map of the area at my side especially when Shehadeh was moving through different areas, Haifa, Ramallah, Jericho, Tyre, Beirut, the Jordan Valley as it made it easier to follow his journey and that of Najib. As a result I had a better understanding of the shifting borders and how the political landscape has changed although I remain bewildered as to how around 750,000 Palestinians became refugees and were not allowed to return to their homes. Admittedly, Shehadeh’s account has a habit of jumping from one century to another, from one country to another and it can be difficult to keep track of things but then we are dealing with a very complicated situation. Here is a man who yearns for political agreement achieved by peaceful means and he recognises that the past is important and we can draw lessons from it, but we must also put the past behind us and strive for an egalitarian society. Forty-something American/Canadian Rhoda Janzen has had a terrible time of it. Her wonderful, gorgeous husband has left her for for a guy called Bob who he met on Gay.com and her troubles multiply as, in the same week, she is hospitalized following a serious road accident. Incapacitated, she decides to return to the bosom of her Mennonite family to lick her wounds. So far so good, I am fascinated by the lifestyle of faith groups such as the Amish and Mennonites and I was eagerly anticipating how Rhoda, a self-proclaimed “bad” Mennonite and 21st Century girl would fit back into this conservative Christian community. However….what I got instead was more like a marathon stint by a stand-up comedian – the “pee-bag” joke was funny the first time I read it but then it cropped up again, and again, and again.. Yes, it’s good to be self-deprecating in a world which sometimes encourages us to wallow in self-pity but after a while it just becomes irksome and there’s surely only so many custard pies you can throw in the face of quirky family and friends before the humour fizzles out. I would have enjoyed this more if it hadn’t been a book – odd to say in the midst of a book review, I know. 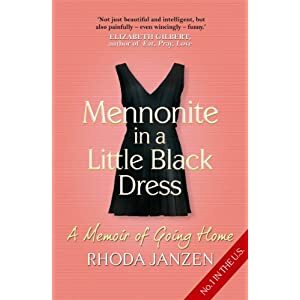 Janzen tells us that friends encouraged her to write the book after receiving funny e-mails from her about her return to the Mennonite community. Indeed it is like a series of rambling e-mails except we don’t have the benefit of dates to aid our navigation through the jumble of anecdotes which would have been much better suited to blog posts or a weekly newspaper column. Janzen jumps about through time and space at a pace which would give Captain Kirk a run for his money. 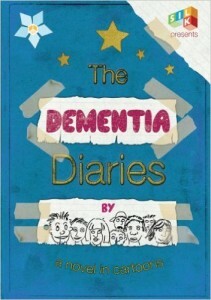 I wanted to know more about how she felt, not hear another tale about her mother’s flatulence! Oh and there’s a potted history of Mennonites and a few recipes from her Mom tacked on at the end – something for all the family! Norah Vincent is an American “immersion” journalist whose previous book “Self Made Man” involved her spending 18 months disguised as a man. Curiouser and curiouser…indeed the strain of adopting this disguise led to the book project for Voluntary Madness, initially intended to be an undercover investigation of the US mental health system, becoming a personal account of Vincent’s descent into depression. Norah decides to voluntarily admit herself to three different mental health institutions with a view to giving a cross-section of available facilities. The first, Meriwether Hospital, is an inner city institution whose clientele are indigent and mostly black and Hispanic. Her second “trip” is to St Luke’s Hospital, in a more affluent area, rural and 95% white. The last stay is at Mobius, a private facility located on the coast where the emphasis is less on medication and more on therapy. Naturally, any investigation of this sort is bound to be slightly skewed as the author has her own mental health issues but nevertheless, Vincent makes some important observations on how we, as a society, view mental illness. We do have a tendency to shut away those who don’t fit the norm, thinking medication is the answer whilst a more holistic approach including a variety of therapies, physical exercise and social contact could well be a more successful approach. Vincent does seem to have a bee in her bonnet about the influence exercised by pharmaceutical companies and yes, there is quite a lot of navel-gazing in what was intended to be an objective report but she does succeed in giving a snapshot of current good and bad practice in the treatment of mental illness. It’s very telling that it cost $6000 to spend 2 weeks in a private facility with individually tailored therapy and almost twice as much to spend 10 days in a public institution with little social contact and hardly any opportunity for physical exercise. 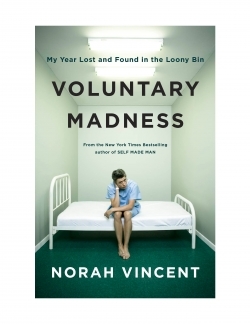 Whilst not a perfect book, Voluntary Madness raises important questions especially in a society where mental illness is stigmatised and where a stiff upper lip is compulsory. This book has been whispering “Read Me, Read Me” to me for quite a while now but I only succumbed when a bookish friend with similar reading tastes wholeheartedly recommended it as a must-read. My inital reluctance was partly due to the “science bit”. I guess I was suspicious of how a non-fiction book about cell biology could possibly draw me in. Therefore I was very pleasantly surprised to be completely drawn into the life of Henrietta and her family and all the medical advances which were her legacy. Henrietta died an extremely painful death not long after being diagnosed with advanced cervical cancer. Radiotherapy was not the fine tuned treatment which exists today and Henrietta experienced very severe side effects whilst trying to keep the gravity of her condition secret from her family. She was a wife and mother of five, one of whom was only a little baby when she died. 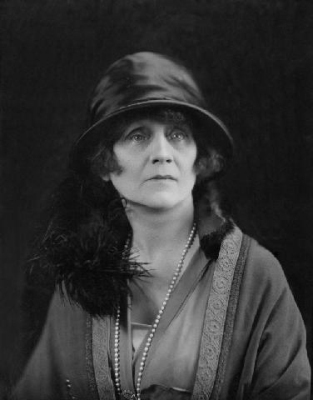 Cells excised from Henrietta’s cervix became the first cells to survive growth in laboratory conditions and thus became the progenitors of HeLa cells which are commonly used in biological research to this very day. 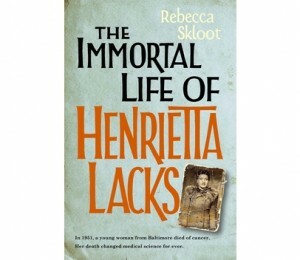 HeLa cells became an extremely effective research tool in the manufacture of a Polio vaccine which revolutionised society – I remember Polio was a frequent scourge of my parents’ generation, an affliction which traumatised so many families and to think that we have Henrietta to thank for being part of the solution. HeLa cells have also been used in research to develop drugs to combat AIDS, cancer, Parkinson’s Disease and many other ailments. However, there is a very human side to this story too, something which some medical professionals perhaps fail to see, hence the recent, long-overdue phenomenon of advanced communication skill courses for consultants. Henrietta’s family were not informed that her cells had been used for research purposes and did not discover this until 20 years after her death. Hence the whole focus turns to ethics and Skloot handles this sensitive subject very well, detailing the development of “informed consent” whereby patients give permission for any part of their bodies to be used for medical research. Such advances in bio-ethics were but a distant dream for the Lacks family as they struggled to understand how Henrietta “lived” on and was indeed “immortal”. The irony is that, as the Lacks family struggled to pay for adequate medical care, the sales of HeLa cells generated billions of dollars for the companies which grew and sold them. Had “informed consent” law been around in Henrietta’s time, would she have given her consent? Would medical research have been set back if she hadn’t? Should Henrietta’s family have had a share in the profits generated by the sale of HeLa cells? Skloot wisely does not attempt to answer these questions but she paints a balanced picture of events where race, patriarchal medical professionals, business, profit and family all play a part. I can see how “scientists” might not value this multi-toned approach but for the “ordinary” reader, this book is a wonderful example of creative non-fiction, presenting the whole picture and thus providing plenty of material for discussion. This is an extremely important book as it uncovers some of the smoke and mirrors of medical research and shows the human face behind what we appreciate as major medical advances in our time. An extremely readable account and I am very grateful that Rebecca Skloot spent ten long, at times, frustrating, years finding the pieces to complete the HeLa jigsaw.